James Dwyer was a member of the Irish Para-dressage Bronze Medal winning team in London 2012, At age of 16 he was diagnosed with bone cancer in his right leg, after 4 months of treatment he under went surgery, where the doctors removed his knee and tibia bone and replaced it with an artificial knee with a bar attached which reached his ankle bone. After surgery the doctors adviced him not ride as the risk of damaging his leg further was too high if he fell off and broke his leg, they would not be able to save it. Two years later he was diagnosed with secondary cancer in his left lung and after another round of treatment, a quarter of his lung was removed. In 1997 after 10 years of pain and infection in his leg, he decided to have a amputation. Within 6 months he was riding again. 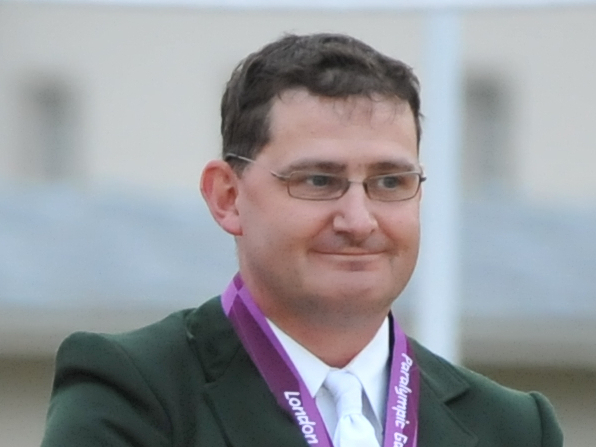 In 2000 he joined Para Equestrian Ireland and started training with Dressage rider/trainer Donie McNamara . Since this time James has competed in many International competitions representing Ireland. In 2004 he based himself in the US with 3 time dressage Olympian rider/trainer Jessica Ransehousen who was also Chef d' Equip for the US dressage team for 4 Olympics. James spent 8 years with Jessica, within his first 6 months with her, he competed in his first Prix St George. He went on to compete in many Prix St Georges against able bodied riders and he competed in 2 CDI's in Florida. In 2010 he was the highest placed Irish rider in World Equestrian Games in Kentucky. In Feb 2014 he moved back to Europe, where he is now training with Chris Haazen and competing in Belgium at Prix St George level and represented Ireland at European Championships in Denmark. On January 2nd 2013 he married South African Para-dressage rider Philippa Johnson.